This timeline displays member numbers of social network LinkedIn from the first quarter of 2009 to the third quarter of 2016, in millions. 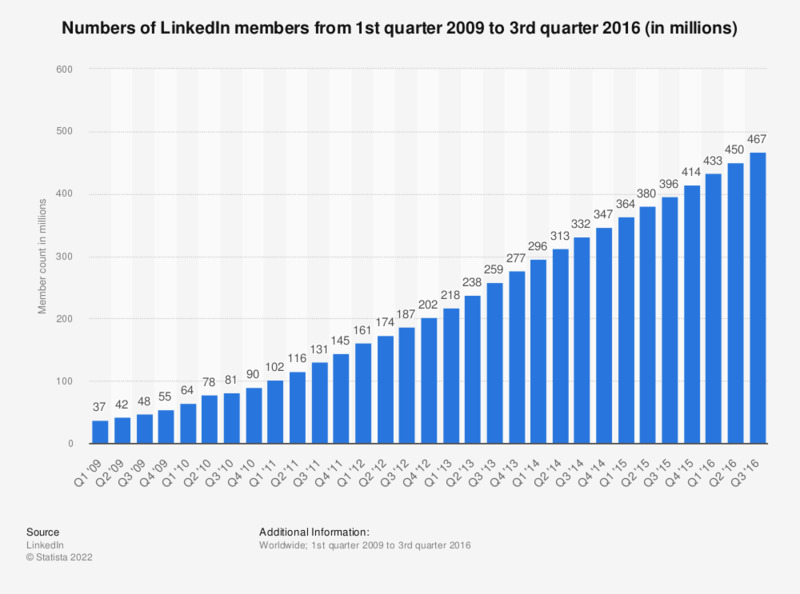 During the most recently reported quarter, LinkedIn had 467 million members, up from 450 million members in the preceding quarter. LinkedIn, which was founded in California and launched in 2003, is a social networking service for businesses and professionals. The site is available in over 200 countries worldwide in 20 different languages. A breakdown, by country, of LinkedIn’s registered membership worldwide, as of 2016 reveals that the majority of members are based in the United States with 128 million Americans registered on the site. India boasted the second highest membership with 35 million and Brazil rounded off the top three with 25 million registered members. Furthermore, smaller countries including Sweden, Denmark, Ireland and Malaysia all had an estimated 1 million registered members each. The networking site allows members to create profiles and make connections with others as a way of establishing professional relationships. This function allows employers to advertise jobs and search for prospective candidates. In turn, job seekers can also search and view the profiles of hiring companies and individuals via existing connections.